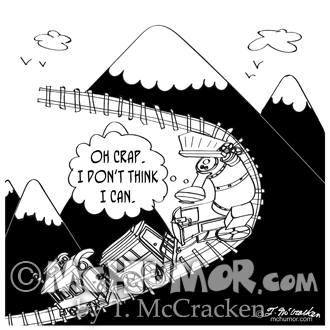 Train Cartoon 3252: "New Migrating Patterns." 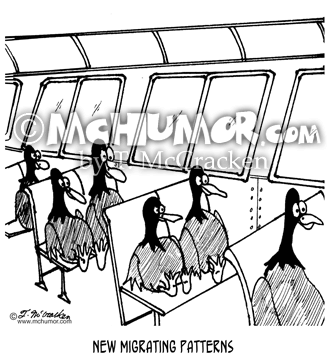 Ducks are passengers on a train. 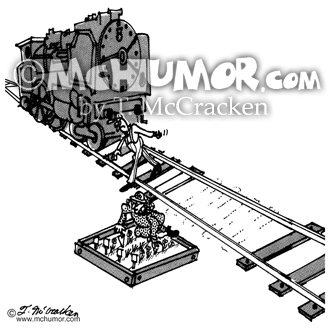 Train Cartoon 2936: An angry engineer getting out of a train that has had to stop because a woman has taken some railroad ties out to build a flower garden in the middle of the tracks. 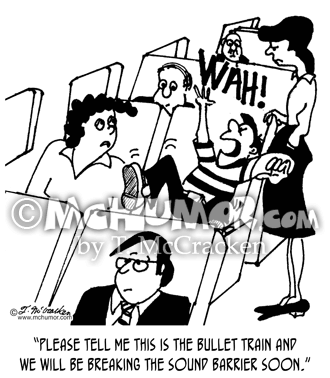 Train Cartoon 7222: A woman on a train sitting next to a screaming kid asks someone, "Please tell me this is the bullet train and we will be breaking the sound barrier soon." 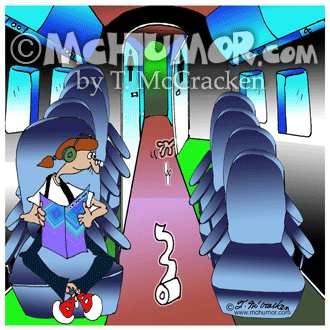 Bus Cartoon 9087: A hand reaches frantically out a bus lavatory door trying to grab a roll of toilet paper that's rolling away and down the aisle. 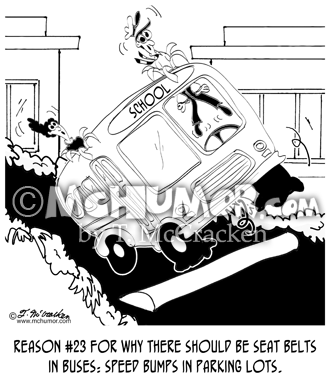 Bus Cartoon 8979: A school bus driver and a passenger bounce through the roof of a bus as it goes over a speed bump. "Reason #23 for why there should be seat belts in buses: speed bumps in parking lots." 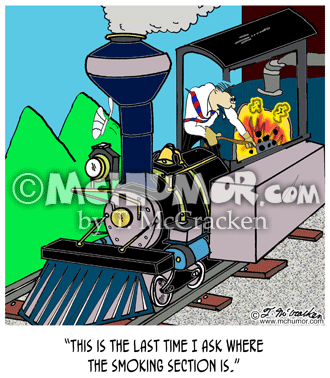 Train Cartoon 8549: A man shoveling coal into a train's fire box says, "This is the last time I ask where the smoking section is." 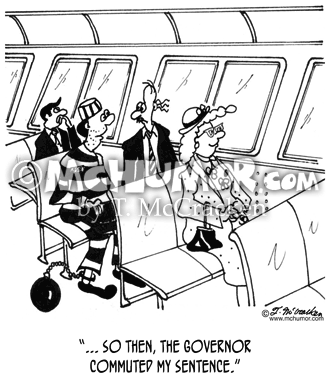 Commuting Cartoon 5620: On a commuter train a man in prison striped clothing holding a briefcase says to another passenger, "... so then, the governor commuted my sentence." 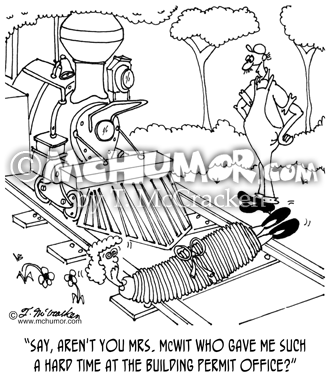 Train Cartoon 6304: A contractor looking at a woman tied to railroad tracks says, "Say, aren't you Mrs. Wit who gave me such a hard time at the building permit office?" 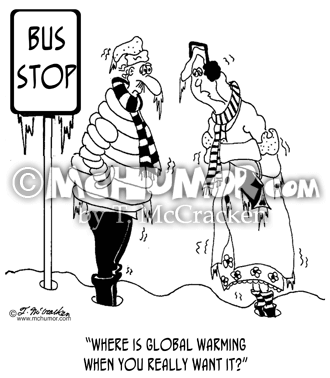 Environment Cartoon 5357: A cold woman waiting at a bus stop saying, "Where is global warming when you really want it?"